I love the idea of minimalism. I love the magazine and Pinterest pictures of clean homes that are completely clutter free and only have four deliberately placed decorations. And for years I’ve strived for this. I’ve donated bags and boxes to the Salvation Army and sold unnecessary belongings on eBay. I’ve felt guilty every time I’ve opened a bedroom door to find it overflowing with toys and detritus that show we have four children living here. And today as I began cleaning out my daughters’ room for the millionth time, the girls just stood in the corner and watched me. They didn’t bother to beg to keep their stuff or try to negotiate the purging of a different toy instead of the one I was holding. And their silence broke my heart. I suddenly remembered being seven years old and watching my Barbie Dream House being sold at a garage sale. I loved the Barbie Dream House and played with it often, but my mom needed cash and clutter stressed her out, so she sold it. The selling of my toys happened often so I just stood there silently because I knew that there was nothing I could do to change her mind. When I remembered my seven-year-old silence, I stopped cleaning out the girls’ room. I put the bag down and gave up on reaching a “manageable level” of stuff. My oldest daughter turned nine yesterday which means that my time with her in my house as my little girl is halfway over. Sure, she could live at home while she goes to college or move back in after she graduates from college, but that time doesn’t really count the same way. She’ll be an adult then. And considering how quickly the last nine years have flown by, I’m pretty sure the next nine will go by just as quickly. I know that all parents say that, but it’s so true. And if she loves the line of 100 bracelets that she looped together so she can pretend it’s her hair and she’s Rapunzel, then she should get to keep that. And her owl collection (she’s up to 17 now!). And her tubs of arts and craft supplies. And all 639 pieces of her bracelet making kit. Because soon enough I won’t have to convince her to get rid of any of that stuff. She’ll be a teenager and she won’t want to make bracelets or refrigerator art or craft projects. She probably won’t even want to collect stuffed owls anymore. As a parent, my priority is my children not my own obsessive need to feel in control of my life by cleaning stuff out. Because that’s what it is. I want to express control over my life by cleaning out. But here’s the thing – I’m not in control of my life. God has a plan for me that no amount of decluttering will ever change. But I know that my children will remember that I constantly threw away their toys because I remember that experience from my childhood. And I remember how it made me feel like my thoughts and desires were completely unimportant. I’m not saying that my kids should be the center of my world. They are third in my life. But they have to know that they are more important than stuff. And sure, there’s tons of evidence that kids with fewer toys are more creative, resilient, and can see through walls (okay, maybe not that last part). But I know that for me the decluttering has never been about building their character. It’s always been about my need to feel in control of my life. Maybe someday I’ll be able to find my peace and calm from my daily devotional time, and I’ll be able to approach the decluttering of my kid’s stuff from a purely normal place. But for now, I’m going to leave the piles of toys and let them play. Most of their toys aren’t electronics so their toys are mostly used as props for all of their pretend adventures. I’m going to pray for God to help me to let go of control and to help my kids know him more. 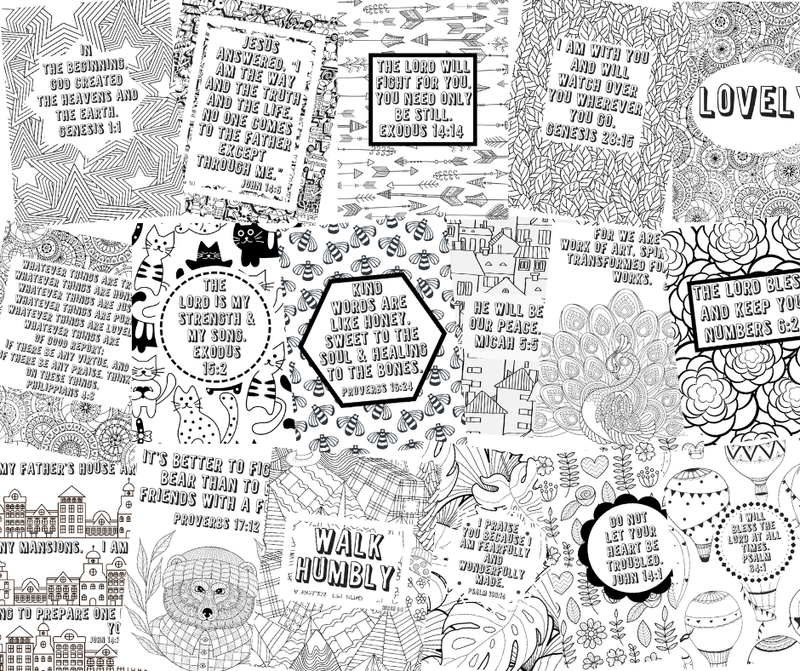 We are going to focus on memorizing scripture, serving others, and striving to live like Christ. And I’m going to order some cute bins from Amazon to put all their stuff in. Because someday I’ll have a nice, silent, toy-free house, and I’ll miss all of those creepy, stuffed owls. At least that’s what all the old ladies who stop me in Walmart keep telling me. 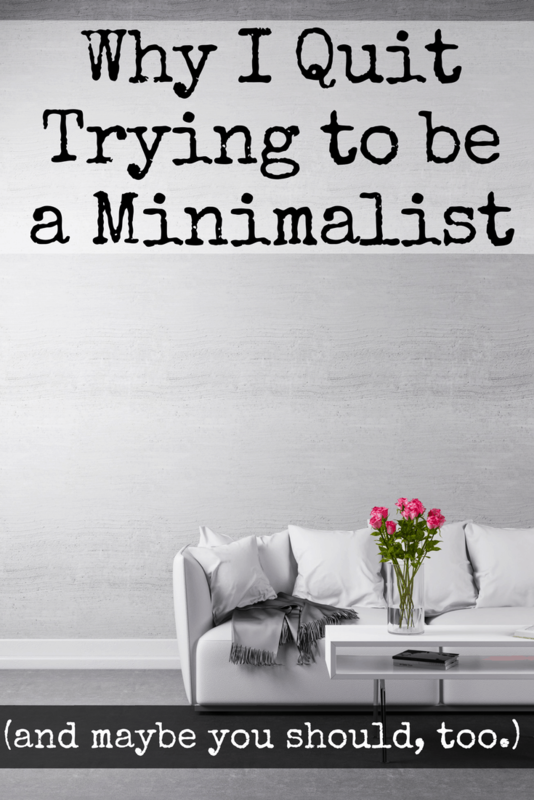 Is it time for you to quit trying to be a minimalist? How do you deal with toy clutter in your house? Tell us in the comments! I still have that picture of my dog (minus the bear) on my refrigerator and even as an adult, I think of that day every now and then when I see the picture! It’s so ugly because I tried to cut it into a heart shape and failed miserably but I don’t care, it’s a memory! It was also like the one time that I deliberately disobeyed my mom! Thanks Emily! I’m glad to hear I’m not the only one traumatized as a child by an intense decluttering session! ? I’m glad to hear that cleaning out gets easier as kids get older. Great post! I have gone back and forth with decluttering not only my daughter’s things but mine as well. I know I have a hoarding problem when it comes to art and yarn supplies and my daughter has adopted that with her 100+ stuffed animals. Sometimes I will have her purge her own toys like the McDonalds toys and other things that she knows she doesn’t play with. If they are in good condition then I will list them for her on our local Facebook yardsale groups and then she can make a couple of dollars to either save or spend. I just need to find a better way to organize the clutter we do keep. 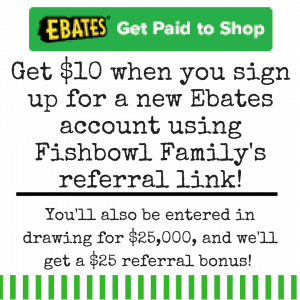 I love the idea of letting your kids keep the profits from selling their stuff! I bet that makes it a lot easier to help them let go! I have never really thought of it that way, I am always purging through my kids toys without a thought about it. It kind of breaks my heart to think about now. It’s just stuff, I would rather them happy and have fond memories, than have an organized home. I’ve always had the mentality that I was doing a good thing for my family by keeping our house clutter free. God really convicted me about my heart in cleaning out stuff. So I’m really trying let go of my desire to clean out and focus on my heart. The struggle is real. The struggle is REAL! I am constantly decluttering, but you are right. You’re only a kid once. I still fully plan to get rid of the broken toys so hopefully that will be enough to keep us from being on an episode of Hoarders! Such a great article! Take time to read…. Great post! Kids are messy and we shouldn’t necessarily force them to part with that aspect of childhood simply because we want to find calm and control. Truly Jesus is the only source of that, not clear counters or empty closets! Blessings! I am going through the exact same thing! 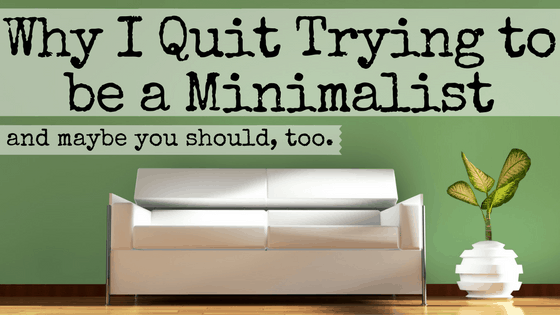 Thank you for voicing my thoughts – I too am questioning minimalism. It holds out such great promises for moms of little kids that fall so short of what Jesus offers. Thanks for writing! I can relate in many ways. I tried living the minimalist life but found it doesn’t suit my family. Clutter stresses me out so we purge once a week and thankfully, my children are pretty easygoing and don’t mind telling me what they no longer want to keep. I have also learned that I also have an issue getting rid of things. The book, “The Life Changing Magic of Tidying Up” had helped me so much over the past few months! I loved that book too! It helped me tremendously in going through my own stuff. But as soon as I start asking my kids, “does this bring you joy?” Every toy gets a “YES!!!!” ? I love this idea and this perspective! I read this just as I was about to clean out my son’s room! Thank you for reminding me that his toys and clutter are not the end of the world and his happiness is more important than cleanliness and organization. Thanks Vanessa! I’m working on finding a balance where they can have all their toys AND our house is semi clean. ? This post is so insightful. I tend to be an uber de-clutterer so you offered a New perspective. I am a mom of 6 with only two left in the nest; I get the whole idea of those precious but fleeting moments with our children. Thanks Denise! When I get stressed, I start cleaning out! I’m working to find my peace in Jesus, but man I love an organized closet! Oh my goodness – I love this post. It’s so true. What a great perspective! Thank you! I am still struggling with leaving the clutter that brings them joy, but I think I’m getting better at it each day. Wow! What an adventure! You are an awesome woman to have seven children AND live in a travel trailer! And you’re absolutely right – simple is the goal. Honestly simplifying is a goal for all aspects of my life, not just my kid’s stuff. I love your honest perspective on this, and I will pray for y’all as you continue in this challenging season of life. How much longer until your husband is finished with school? That’s awesome that your 1 year old can do that! We try to emphasize relationships and experiences over stuff as well. But it seems like the toys they really treasure are the ones that have 6,000 pieces! 😂 And I totally agree about family getting on board. If ours would, decluttering would be much easier! At the age of 41, I have been drawn to the minimalist lifestyle after being a pack rat all my life. The irony is that my 5 year old is a pack rat, wanting to keep everything, including cardboard boxes. Seriously. I have found that doing a sweep of his room on a regular basis when he is not home is the way to do it. All I get rid of is trash and things I have not seen him play with in a very long time. I will not get rid of anything he loves, minus the trash, of course. Good luck on chilling. I’m not naturally good at it, so I really have to make an effort. Let me know how it goes! And send me all your packing tips as well! Thank you!!! I think minimalist approach was a great journey for my family of 5 in the 12 months we did it. I learned so much. I definitely enjoyed less to clean up and organize. But it didn’t bring as much joy as I thought it would. In the end, we did keep toys to minimum. One per birthday and 3 for Christmas. Focus on Where or What we do as a family. Like trip to zoo or Disney on ice instead of material things. Everything else we brought back :). More books than I can count, more dishes in cupboard than needed, more than 10 outfits per person, etc. I loved my stock pile of clothes for kids to grow into some day! I decided a strict but fun teamwork after dinner routine was better. Can you dance as you hand wash dishes- yes! Can you race to pick up room in 20min or have (kids:no!!!) earlier bedtime? Help mom do this HUGE task that would take FOREVER or no treat. Things like that. Find a balance!🤗 Enjoy the childhood mess and those precious time with them. Real life= real (messy ish) home.